There has been much to catch up on the home front since returning from the workshop, but I have been reviewing the material and have shared it with one person. I have two more volunteers eager to go through the material with me and I hope to meet with them this week. Hopefully, I will be calling you soon with an update. There are four others that I hope to be able to share with in the near future, too. Everyone I know would benefit from being exposed to and thinking through these things! The Lord continues to deepen my own understanding, experience of, and appreciation for the exchanged life that is mine through Jesus. What a wonderful Savior! The conference and workshop were such a blessing! I’m so glad I was able to be a part of that time. The Lord used each one of you present to speak into my life in a unique and special way. You did an excellent job of teaching, mentoring and encouraging all of us. Thank you so much. I pray all is well with each of you and your families that are associated with Grace Fellowship. You are all thought of with such fond remembrance. Your labor of love continues to bear fruit. May the Lord continue to bless your ministry to equip the body of Christ with the transforming truth of the exchanged life and to expand your reach for the furtherance of His kingdom. To the praise of His glory, always! There it was again. First a puzzled look, then the dawning of hope-infused wonder gently overcoming the stubborn despair that had been etched into her countenance by years of disappointments. “I mean it sounds too good to be true, but it’s right here in the Bible.” Tears overflowed onto her reddened cheeks, but this time, they were tears of joy, and no longer the bitter residue of a wounded heart. Once again the promise of Jesus had come true before my eyes: “Know the Truth and the Truth will set you free.” Jesus Christ, the living Truth, The Way to live victoriously over sin and self, and the abundant Life every believer has longed for, had set one of His beloved children free in a way she had never dreamed possible. As the Director of a Rescue Mission for women and children, for years I had sought to find God’s answer for the depressed, addicted, and abused people that came through our doors every night. Yes, we shared the salvation message with all, but to take every person through the in-depth counseling, deliverance, and healing they needed was impossible. But knowing God’s heart for the “least of these”, I knew He had a simple Truth to bring every one of them freedom from the power of Sin, deliverance from the trauma of the past, and hope in the midst of desperate circumstances. And God answered my prayer by bringing me to Grace Fellowship International. Though I had read several books that taught the Exchanged Life, by watching the conference DVDs and attending the Workshop I came to know the Person of Jesus Christ in me and as me in an unshakeable way. This awareness has continued to free me from a lifelong struggle with depression and perfectionism. Then, as I learned how to share these truths with others, I participated in their joy as they too received the freedom one can only get as they lose their life in order to find it. The icing on the cake came with the privilege of meeting Dr. Solomon, his family, Dr. Woodward, and other members of the G.F.I. family, as fellowship with them was alone worth the investment of time and money. They have continued to pour into my life with loving encouragement and wisdom, demonstrating a profound servant humility. My life, as well as the lives of those I serve, my family, and many others with whom I have shared the Exchanged Life, will forever be enriched by my time at Grace Fellowship. If you have the opportunity to attend the Conference/Workshop, do not pass it by. As the “called out ones”, we must learn of the power of God that is available to every one of His children (see Eph. 1:19). And not for our sakes only, but for the sake of the world around us that is being destroyed for lack of knowledge (see Hosea 4:6). If the Church truly awakened to the empowering Truth contained in Galatians 2:20, the truth that G.F.I. emphasizes, we would see transformation in individuals, families, communities, and nations. God is calling His children to awaken from our self-induced slumber, and shine with glory of our Savior and King. Let’s embrace His mandate to disciple the nations, for truly, we were born for such a time as this. 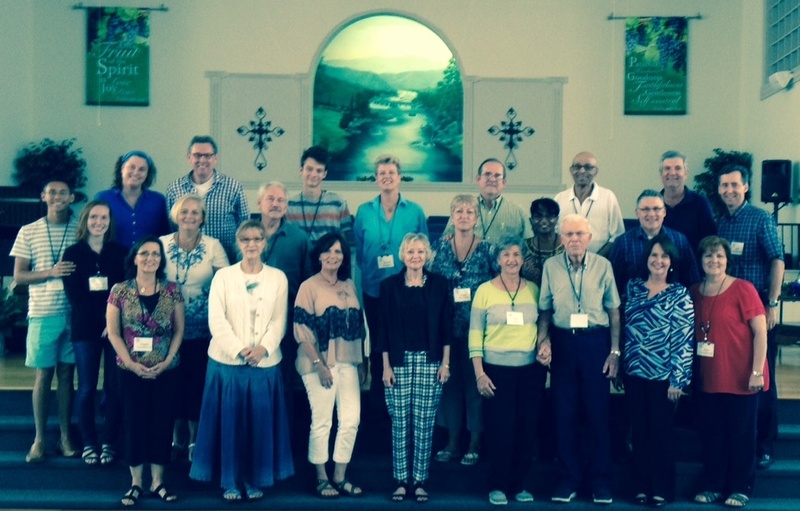 Grace Fellowship conducted an Exchanged Life Conference in Pigeon Forge, TN August 1,2. We are thankful for those who attended from six states. The next one scheduled is to be held at Bethesda Fellowship in Miami, FL Sept. 19, 20. John Woodward will be the presenter. For details, contact Bryan Miller by email. August 4-7 was our Workshop. About half stayed for this 3.5 days of additional teaching, training, equipping and fellowship. Please check out GraceFellowshipIntl.com for details on the next Conference and Workshop!